This distinctive style is a great way to bring the drama of Tiffany glass into a Misson, Contemporary or Modern room setting. The hand-cut, iridescent art glass is arranged to form a slender triangle pattern in shades of rich ebony and warm yellow. 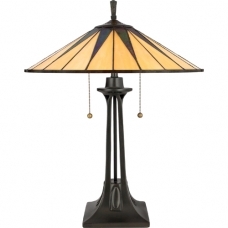 Comes on a very stunning Transitional Base with a Vintage Bronze Finish. Simply beautiful and there are matching items as well.